Ever since establishment, we at Shimi Research Center Private Limited have been engaged in manufacturing vast range of Electrostatic Precipitator, Wet Scrubbers, Cyclones Unit and many more. Apart from this, we also provide remedial solutions for environment & pollution, system analysis, waste management, recycling technology and process control. All our products and services are offered under our experienced team members. Our expert team of consultants helps our clients to meet with their requirements and specifications. In the course, we are even involved changing and upgrading infrastructure for industrial and commercial organizations in accordance with the relevant laws. Met Trade India Pvt. Ltd.
Services and Outsource Manufacturer of Bag Filters, Electrostatic Precipitator, Air Pollution Control Service etc. We are supported by a team of experts in our company which is why we are able to meet with all the demands of the clients yet at the same time keep pace with the ever changing market evolution. We are sincerely assisted by technical personnel, environmental scientists, chemical engineers, project execution team, consultants, engineers, production specialists, quality inspectors, supervisors and other skilled workmen. We have other team members for activities like logistics and transportation, warehouse, sales and marketing, packing and others. Having several years of experience in the industry, our group members give their best effort in meeting with each specific requirement of the clients. Their understanding, awareness and knowledge have come with immense benefits to us. We are one of the leading names engaged in manufacturing, supplying and exporting a vast range of industrial pollution control systems. Our product range includes wastewater plants, industrial blowers, bag filters, cyclones and scrubbers. Every product would be as per the international quality standards and required client specifications. Our large range is manufactured with precision under controlled environment. Each product is at par with durability, resistance, defect free structure, design, strength and other features. Strictly tested on various parameters, only the most qualitative products is delivered to our clients. Dr. Renu Rustgi, Director : She has doctorate in Polymer Science and Technology from Delhi College of Engineering, University of Delhi, presently working as the director of the company. She specializes into the field of waste water treatment, biodegradable polymers and solid waste management. Further on, she has published 8 research papers in international and national journals and has provided environment friendly technologies to small-scale industries. Dr. Abbas Adab, Director (R & D): Possessing doctorate in Polymer Science and Technology from Delhi College of Engineering, University of Delhi, Dr. Abbas Adab, specializes in the development of water-soluble polymers used in water treatment. In past, he has worked as supervisor and in charge, Polymer Research Laboratory, Department of Applied Chemistry and Polymer Technology, Delhi College of Engineering, Delhi. To his credit, he has 10 research papers in international and national journals of repute and a book on Recycling of Rubber and Plastic. Moreover, he has coordinated with many industrial projects and provided environment friendly technologies to small-scale industries. 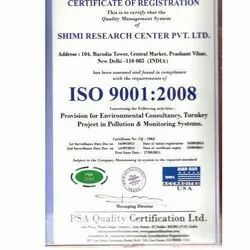 Other than the products that we are offering, we are also engaged in providing consultancy services pertaining to environment, pollution control, system analysis, waste management, recycling technology and process control. We are serving a spectrum of industries in the market wherein we have witnessed an unending list of clients. We work in a close co-ordination with our clients to accurately assess their needs and provide customize solutions. Following ethical business standards and transparency in the enterprise falls in our domain which is why we are always preferred unlike others. Over the years, we have brought more constructive changes in our work process be it in terms of technology or other resources. Resultant, we have witnessed a huge lits of clients a satisfying them is our prime goal. To be the market leader in providing clean and cost effective technological solutions that help companies be responsible towards the environment. Our business is guided by a strong focus on integrity while ensuring breakthrough innovations at each step.